1.Stock Bubble? $8 Trillion in Bonds Outstanding have Negative Interest Rates. Sometimes clients ask me “Where is the bubble in financial markets?”. I think the answer to that question is easy: It is the red area in the chart below. 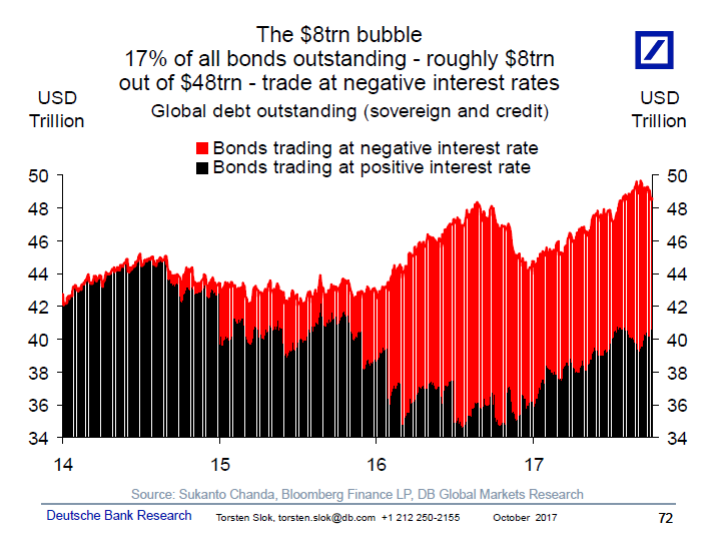 $8trn in global debt is trading at negative interest rates. Think about it; almost a decade after the financial crisis we still have $8trn in bonds which yield negative returns. It is the unattractiveness of these bonds for investors which is the biggest bubble in markets today. These $8trn in negative yielding assets have forced investors around the world into all kinds of other asset classes such as IG credit, loans, mortgages, HY bonds, equities, and even emerging markets fixed income and equities. The Fed running down their balance sheet by a 50 billion here and $50 billion there is not going to make a difference to this chart. The real test will be when the red area in the chart below turns black. 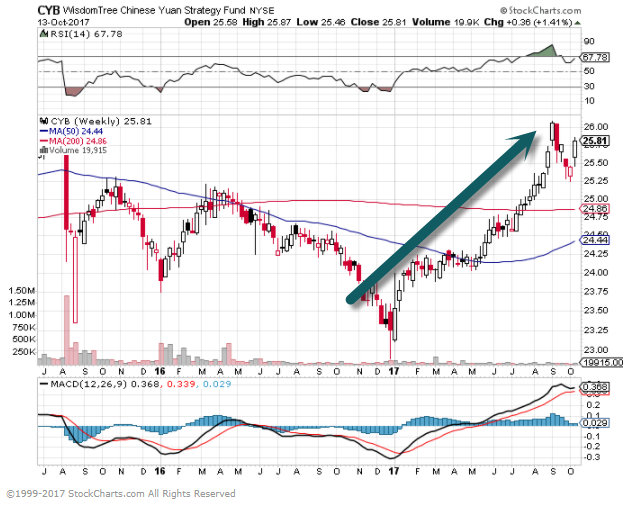 When these $8trn suddenly begin to yield a positive return how are global investors going to react? The fear is that when the risk-free interest rate goes higher then credit spreads will widen and equities underperform as investors leave risky assets and come home to higher-yielding government bonds. In finance terms, if the risk-free rate goes higher why should I then be buying risky assets? When will this bubble burst? It will happen the day we begin to see inflation in the US. Because higher US inflation will mean more and faster rate hikes from the Fed, which will mean higher rates globally, including in Europe and also Japan. The good news is that consensus doesn’t expect US core inflation to move higher until 2018Q2. The bad news is that the $8trn in the chart below shows that investors don’t believe we will ever see inflation again. The bottom line is that the central bank exit has barely started and once inflation does start to move higher then checking out from Hotel Easy Money will be a lot more difficult than checking in. Talk of tax reform has been beneficial for financial firms, as interest rates have risen and banks have an average effective tax rate of nearly 30%. Bank stocks are also benefitting from attractive valuations and growth. 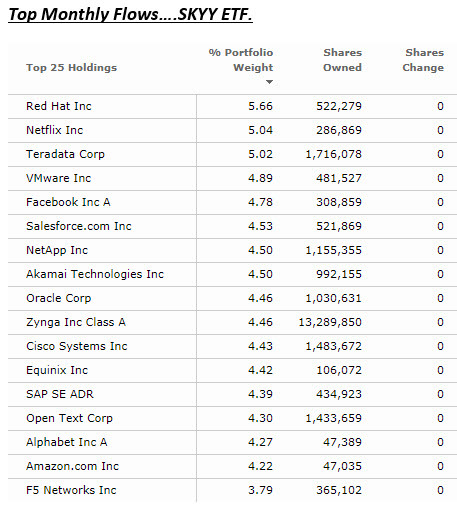 As shown below, investors funneled $1.5 billion into financial sector equity ETFs during September. Energy is the horse to watch down the stretch for a comeback story. With the spot price of oil increasing to more than $50/barrel, inflows reached nearly $1 billion in September. 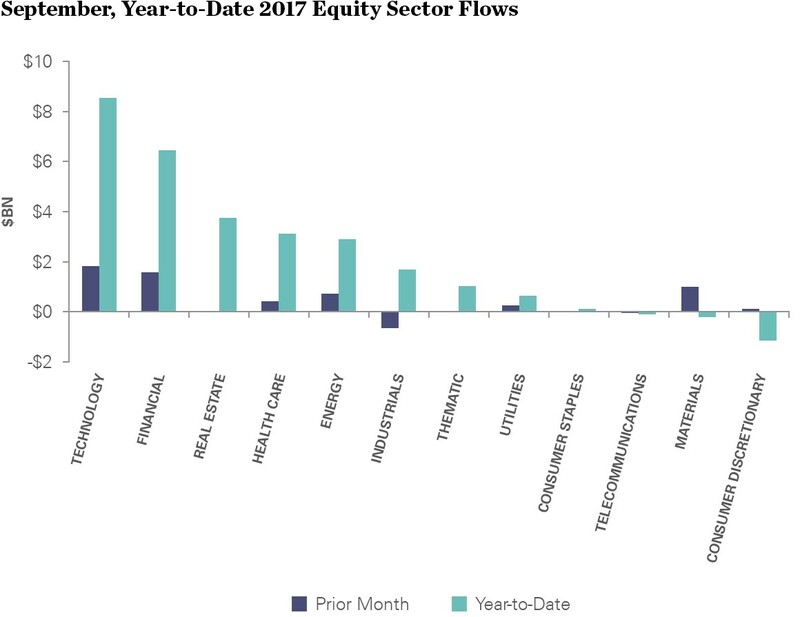 In another sign of positivity for the sector, short interest for energy-related sector ETFs declined during the month. 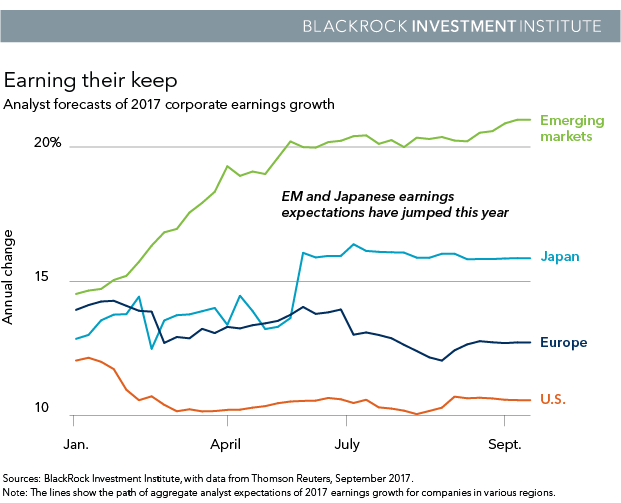 Much like trainers fawning over a horse with strong lineage from overseas, investors have sought out non-US exposures all year. 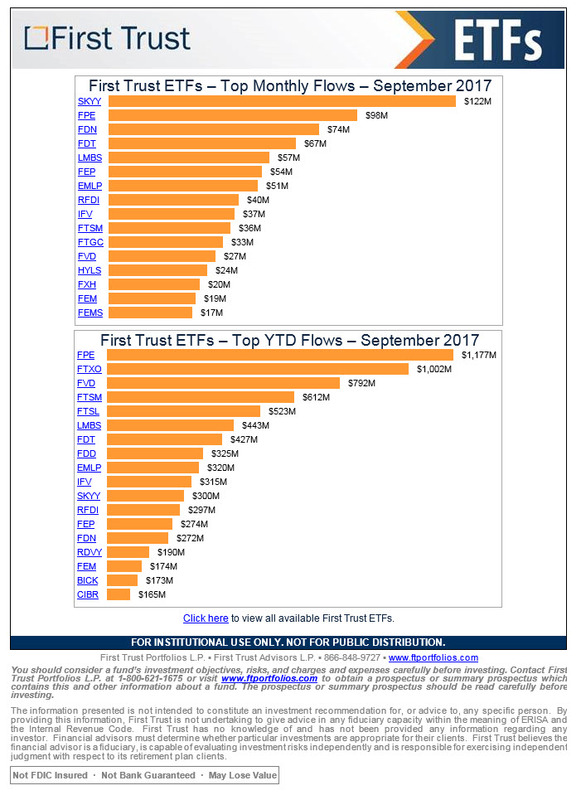 As shown below, inflows into US ETFs have topped $100 billion year-to-date, representing 7% of start-of-year assets. 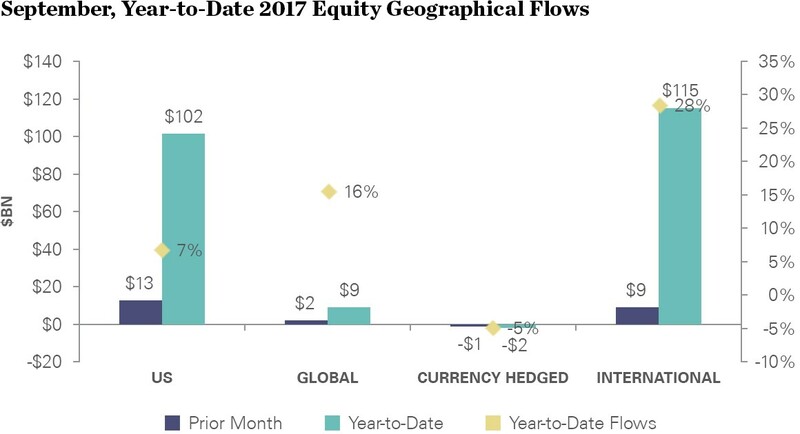 Meanwhile, inflows into international ETFs total $115 billion, equaling 28% of start-of-year assets. This shift is not surprising, given attractive valuations and projections by the International Monetary Fund that the engine of growth will be outside of the US. 3.More Flow Show..Where are Advisors Allocating? 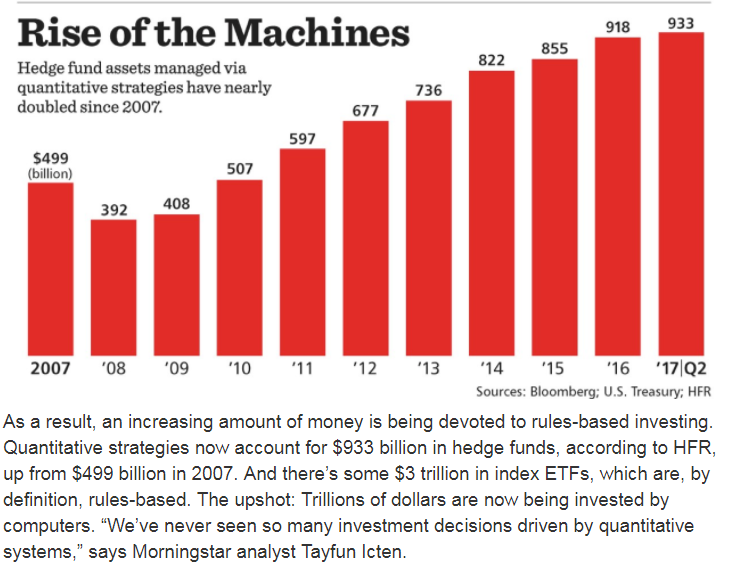 4.All These Flows into “Rules Based” ETFs + the Rise of Quant Based Hedge Funds to Almost $1T Creating New Crowding Theories Around Crashes. 5.After 2016 Weakness…Chinese Currency having Strong Year. 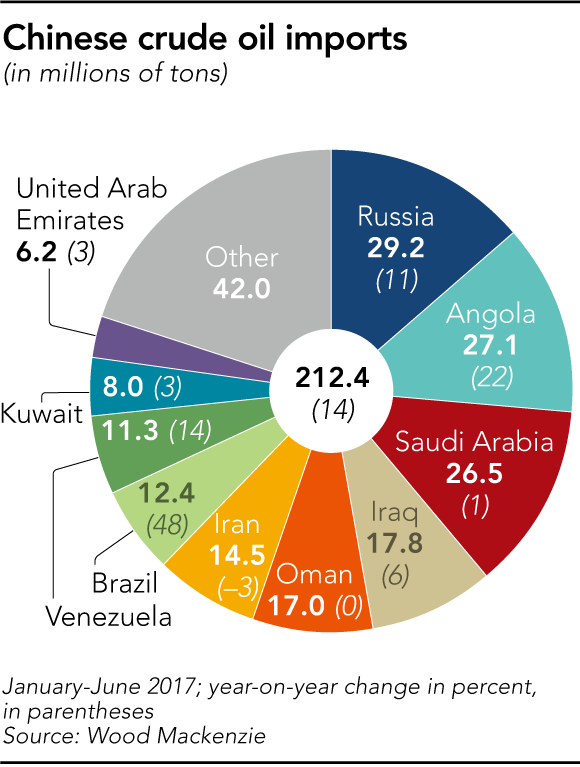 Remember Earlier this Year China Started Trading Some Oil Markets in Yuan…Including Angola 27% of Chinese Imported Crude. The crude oil futures will be the first commodity contract in China open to foreign investment funds, trading houses, and oil firms. The circumvention of U.S. dollar trade could allow oil exporters such as Russia and Iran, for example, to bypass U.S. sanctions by trading in yuan, according to Nikkei Asian Review. To make the yuan-denominated contract more attractive, China plans the yuan to be fully convertible in gold on the Shanghai and Hong Kong exchanges. China is set to launch an oil exchange by the end of the year that is to be settled in yuan. Note that in conjunction with the existing Shanghai Gold Exchange, also denominated in yuan, any country will now be able to trade and hedge oil, circumventing U.S. dollar transactions, with the flexibility to take payment in yuan or gold, or exchange gold into any global currency. 6.Japan and Emerging Markets Earnings Expectations Double. A sustained expansion supports company earnings growth, we believe. All major regions are posting earnings-per-share growth higher than 10% for the first time since 2005, excluding the post-crisis bounce, our research shows. Analyst forecasts are holding steady in the U.S. and Europe, Japan is up and emerging market (EM) earnings expectations have almost doubled this year. See the chart below. 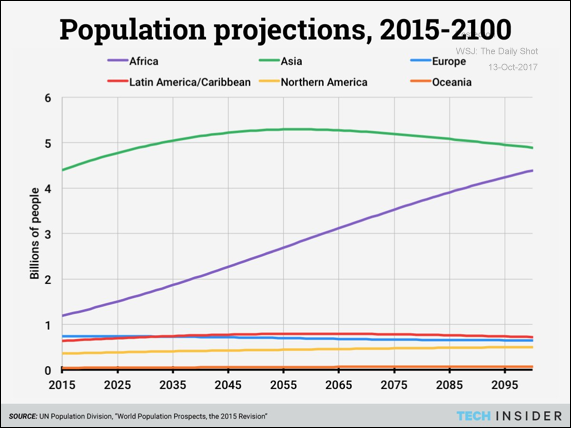 7.Food for Thought: Here is a long-term global population projection. 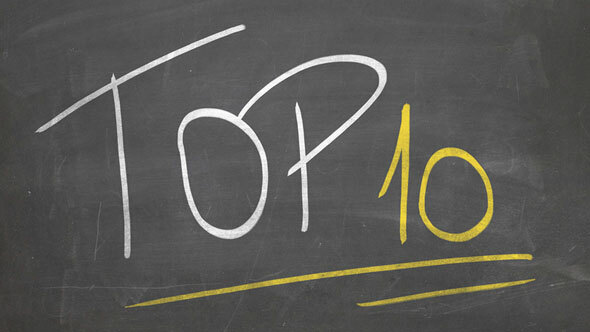 8.Read of the Weekend…Smart Phones are Frying Our Brains. 9.Read of the Day…What do Young Investment Bankers Worry About? Business Insider recently compiled a list of the top talent on Wall Street age 35 and under, interviewing dozens of bankers, asset managers, and traders in the process. We asked the crop of dealmaker candidates making waves in investment banks and private-equity shops the same question: What’s your biggest concern about the industry? While responses varied — some bemoaned market trends, like record-low volatility and sky-high valuations — a strong current ran through the vast majority of answers that underscores Wall Street’s challenge in keeping up with Silicon Valley. Most notably, bankers are concerned with Wall Street’s ability to recruit and retain young talent given the competition from tech giants and startups that offer juicy perks, a more relaxed lifestyle, and an exciting, entrepreneurial environment. There’s a reason Goldman Sachs is rebranding itself as a tech company and trying to hire engineers in droves. The industry has changed swiftly since the financial crisis, and the stable, predictable career trajectory calcified over decades on Wall Street has largely been thrown out the window. A handful noted that banks, despite marked improvements in recent years, still struggled to offer a healthy work-life balance. Many of the people we spoke with in their early 30s had recently become parents, mixing that daunting responsibility into the cocktail of one of the most competitive, high-pressure career tracks out there. And in the same vein, young financiers are concerned that the technologies coming out of Silicon Valley may further drain the pool of opportunities. “There’s a lot of fear about how much technology can replace day-to-day tasks,” one banker told us. Former Citigroup CEO Vikram Pandit said last month that 30% of banking jobs could be gone within five years from the threat of automation and artificial intelligence, though relationship-based practices like investment banking face less risk than trading operations. “I do think we need to be better coordinated about how Wall Street will protect itself against outsiders who are going to be encroaching on the banks’ turf,” another rising banker told us, highlighting Apple Pay, PayPal, and blockchain as emerging threats. Banks may continue to struggle to lure talent back from Silicon Valley, but they’re awake to technology threats. Investments in private tech companies by banks have soared in recent years. Goldman Sachs is leading the charge, but Citigroup, JPMorgan Chase, and Morgan Stanley are all very much in the game as well.